We mostly try to focus on TNR, finding colonies of feral cats and getting them all fixed up and returned. When we leave, everything is essentially the same, but the cats do not reproduce and are (we hope) healthier and happier than before. This solves one part of the multi-faceted problem of cat population control. Another facet is what to do with the 'nice' cats. Malibu is one of the 'nice' ones. A very tame stray cat, she was hanging around the lot where we recently TNR'd a colony of ferals. She was hugely pregnant so rather than risk her giving birth outside we took her home. I actually intended to get her spayed immediately, but once she was home we realized she was really too far along to fix her at this stage. 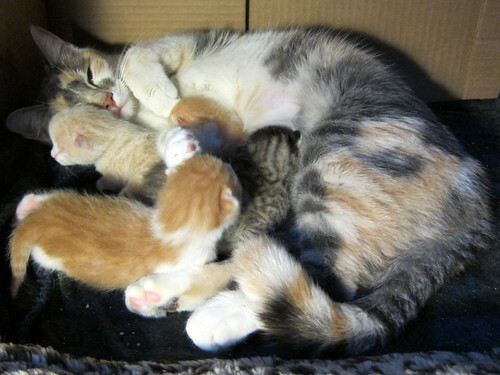 A week later (the same day, ironically, the rest of the cats were getting fixed) she bore 5 kittens. 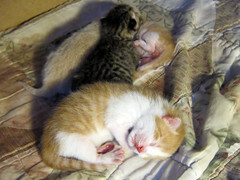 One was stillborn but the other 4 seem very healthy. We've been watching them grow from mute little worms into increasingly-curious puffballs who can walk unsteadily and play with each other when not furiously nursing on mom. We've been down this road before with Lucy, the first official Bushwick Street Cat back in 2007. We really didn't know what we were doing then, and in some ways we still don't. We still take in tame cats even though we're not completely sure we can find homes for them all. Some amount of self-delusion is required: I don't think I could have taken Malibu home that day if I didn't think I'd just get her fixed and then return her to the street the next week. Of course, now it seems impossible, she was clearly about to pop and what's more, she's way too sweet to every think of abandoning on the street. Unlike true feral cats, this lady is a prime candidate for adoption. This is what we end up spending most of our time doing, collecting and caring for the abandoned pet cats of Bushwick. It's not what we really want to be spending our time doing as it is time-consuming and keeps us from our official goal of TNR'ing. But we have a pretty good track record at finding new homes for them, even some tough cases, many of which worked out better than we could have imagined. And really, kittens are easy! 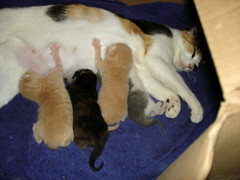 Malibu has been doing a great job of keeping the kittens well-fed and clean. We treated a couple of them for cold-like symptoms early on but now they're really rolling along well. 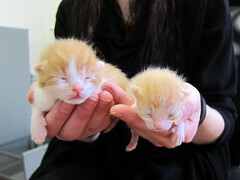 They just hit the 3 week-old mark and they're starting to walk around and play. It's been a fun experience and when the time is right it shouldn't be too difficult to adopt them out, kittens are always in demand. It will be harder to find Malibu a home as an adult cat, but we won't mind holding onto her until we do. The right person always shows up eventually. Watch the kittens on their webcam! Or check out their photo album. This entry was written by Jimmy Legs, posted on April 5, 2012 at 3:02 pm, filed under Cats and tagged adoptable, cat, Feral, kittens, stray, tame, TNR. Bookmark the permalink. Follow any comments here with the RSS feed for this post. Both comments and trackbacks are currently closed.